As the first of its kind built on a public campus in the United States, the Longhouse is a multipurpose facility—able to serve a variety of educational and cultural functions. The internal post-and-beam support system, (constructed with two-foot wooden columns that remain visible), allows the interior "Great Hall" to be opened for gatherings, performances and lectures, or to be partitioned into three large classrooms and an intimate seminar area. Longhouse facilities are in close proximity to all campus resources. At 18,020 square feet, the Longhouse accomodates 400 people for academic program lectures, conferences and cultural events. 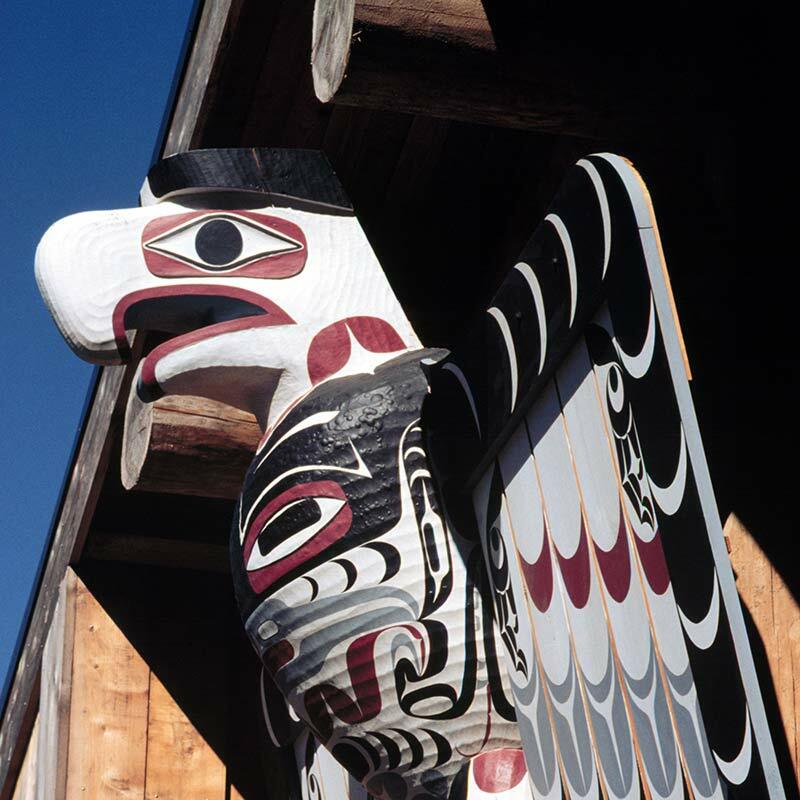 To make a reservation for use of the Longhouse, please email or call Conference Services at (360) 867-6192. On-campus groups may call Space Scheduling at (360) 867-6314. All other questions should be directed to Laura Grabhorn, Assistant Director: (360) 867-6413. The Longhouse is unlike any other building on campus. It embodies the partnership between The Evergreen State College and the surrounding Indian tribes. It was built on a foundation of respect and acknowledgement for the original Indigenous Coast Salish peoples of the land in this region. Out of respect for the Indigenous peoples of this land, we ask that you refrain from the use of drugs or alcohol in and around the Longhouse. Groups who reserve space in and around the Longhouse are responsible for the scheduled activities and will be held accountable for infractions of the permanent ban on the use of drugs or alcohol in or around the building. You are invited to learn more about Longhouse culture and protocol by participating in annual events, such as: the fall Community Dinner, the Holiday Native Arts Fair, the spring Cleansing Ceremony, and other featured events throughout the year. Upcoming events can be viewed here, or on our Facebook page. The Longhouse has a Student Lounge (room 1001, to the left of the main entrance), that any Evergreen student may use. There are comfortable chairs, work tables and wireless internet, making it an ideal place to study, read, relax or hold small meetings. The lounge is open during normal Longhouse business hours (Monday through Friday, 8am - 5pm, and Saturday & Sunday, as scheduled). One of the original intents of having a longhouse at Evergreen was to provide a space where students from all cultures could gather—all students are welcome! The Longhouse has a variety of audio, video and media capabilities. The North Classrooms (1007A and 1007B), both have self-service media which includes built-in screens, data projectors and wall jacks for a laptop, DVD and VCR connection. The Cedar Room (room 1002), does not have any self-service media capability. Additional audio/video/media services can be arranged for any space in the Longhouse through Electronic Media. If you have reserved one of the North Classrooms and would like training on the self-service media, or if you require additional audio/video/media assistance, please contact Electronic Media. *Please note that some use of the audio/video/media in these spaces have charges associated with use. Please contact Electronic Media for more information. Food events at the college need to comply with the current food vendor contract, the college's food event policy, and Thurston County Health Department food codes. Dining service provider, Aramark, has an exclusive contract to provide food for campus events. Please consult the Director of Residential and Dining Services to determine if your event is exempt from Aramark's contract. If Aramark is providing the food, your food event is in compliance with health department rules and campus policy. If Aramark is not providing your food, please consult the college's food policy. Indoor, wood-burning fires in the Cedar Room are reserved for ceremonial purposes only. The Cedar Room fire pit is not intended for casual or daily use, and neither (indoor nor outdoor) fire place may be used for cooking. The outdoor fire pit (located at the rear of the Longhouse) can be reserved and used by staff, faculty, student groups and classes of The Evergreen State College. Please complete the Longhouse firepit reservation form (Word) to reserve the outdoor fire pit. All Longhouse fires, both indoor and outdoor, are subject to the bans and restrictions imposed by the Thurston County Olympic Region Clean Air Agency (ORCAA), and no fire can be permitted if a burn ban is in place at the time the fire pit is to be used. You can view information on current burn bans in Thurston County, here. The vent must be turned on when the fire pit is in use. The draft inducer control switch for the Cedar Room is located on the wall near the kitchen door. Seasoned wood that burns hot and produces very little smoke or sparks must be used—alder and maple are recommended. Wood that cannot be used includes: wood that is green, wet, processed or chemically treated. Do not use fir, pine or cedar. No lighter fluid or chemicals may be used to start the fire. The fire pits must be maintained and cleaned after each use by the user. Ashes must be disposed of in a safe manner, taking care not to put hot ash or coals near flammable materials. In the event that the scheduled user fails to clean the fire pit, cleaning will be done by Facilities Services and charged back to the appropriate budget. For any further questions, and to access the fire pits, please contact Laura Grabhorn at the Longhouse: grabhornl@evergreen.edu or (360) 867-6413. 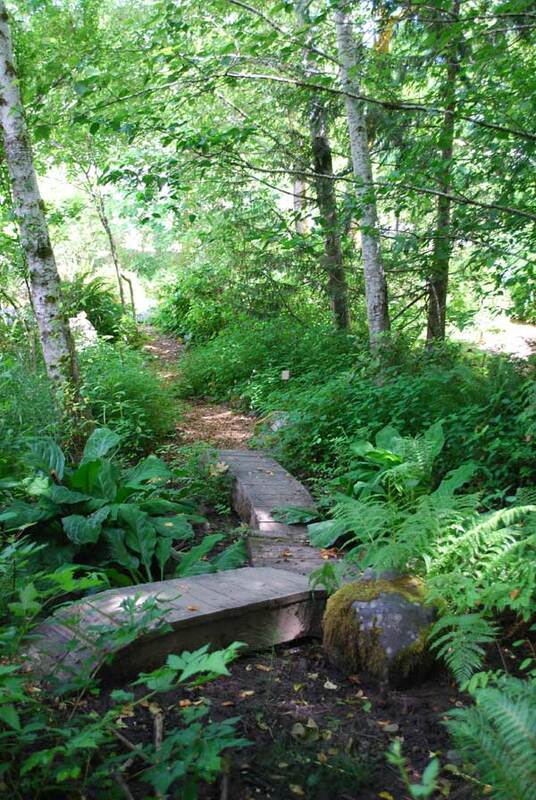 The Gifts Garden—shortened from "Gifts of the First People," consists of several ethnobotanically-oriented habitat and theme areas, and honors the late Skokomish cultural leader, subiyay, G. Bruce Miller. subiyay first gave this name to a related garden project on the Skokomish Indian Reservation, and served as a mentor for the garden at the Longhouse as it developed and grew. Now, we give back our appreciation to subiyay by dedicating the garden to him. The original vision for The Gifts Garden emerged before the Longhouse was built in 1994. Colleen Jollie, the original Longhouse Project Coordinator, and Marja Eloheimo, long-term contingent faculty, were both inspired by the idea of an ethnobotanical garden on the site, especially when a funding shortfall prevented installation of the landscape plans. Eloheimo struggled for, committed to, and eventually received permission for her current and future students to develop and care for a garden, that features plants that are native to the Pacific Northwest, and that are arranged in habitat areas reflecting the conditions in which they would naturally occur. This became the first of Evergreen's Teaching Gardens. 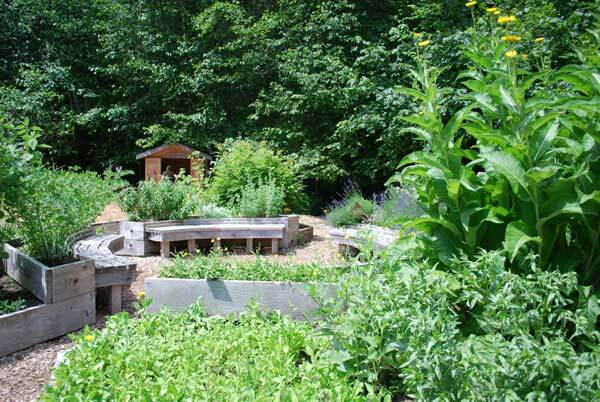 Today, the garden contains forest, wetland, riparian, prairie, and high elevation habitats, as well as "theme" areas that focus on demonstrating edible forest systems, creating habitat for pollinators, and replicating a medicinal plant garden, which were co-developed with subiyay on the Skokomish Indian Reservation. In this garden, we show the plants respect in several ways. For example, approximately 80% of the plants present have been salvaged from development sites. In order to plant these and other plants in suitable locations, we deepen our understanding of their growth needs and habitat affinities. We include name signs (with the English, Twana, Lushootseed, Twelshootseed, Chehalis and Latin names) to help visitors learn to recognize and identify the plants. A garden of exactly this type would not have been traditional in this region. Nor would many of the plants present have occurred at a traditional Longhouse site. 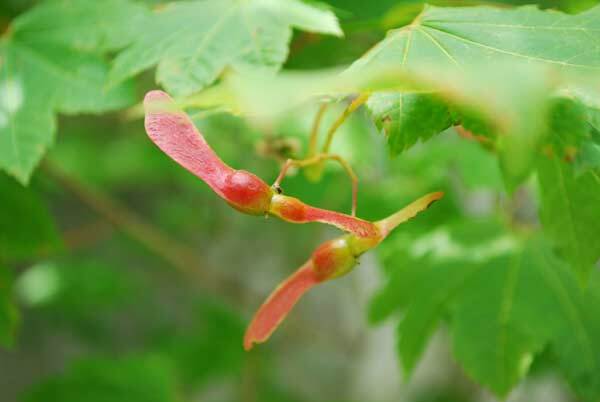 However, the location of The Gifts Garden draws attention to how deeply and fully First Peoples have understood their plant relatives, and with what great care they have interacted with them. Additionally, plant names in local Indigenous languages (including Lushootseed, Twelshootseed, Twana and Chehalis) are included whenever possible on plant identification signs. This purpose supports the type of learning that situates understanding of traditional plant knowledge within larger cultural contexts as well as integrates ecological with cultural sustainability. This garden provides an opportunity for engaging with living plants and with dynamic-interactive habitats. The possibilities for engagement are enormous. They include contemplation, observation, description, measurement, drawing, tending, harvesting, processing, utilization, design, interpretation and planting, among others. This garden offers resources and inspiration for students of the humanities, the arts, culture, natural sciences, environmental sciences, chemistry, language, education, psychology, and social and health sciences, to expand learning within their own discipline, to integrate learning across disciplines, and to collaborate with students of other disciplines. 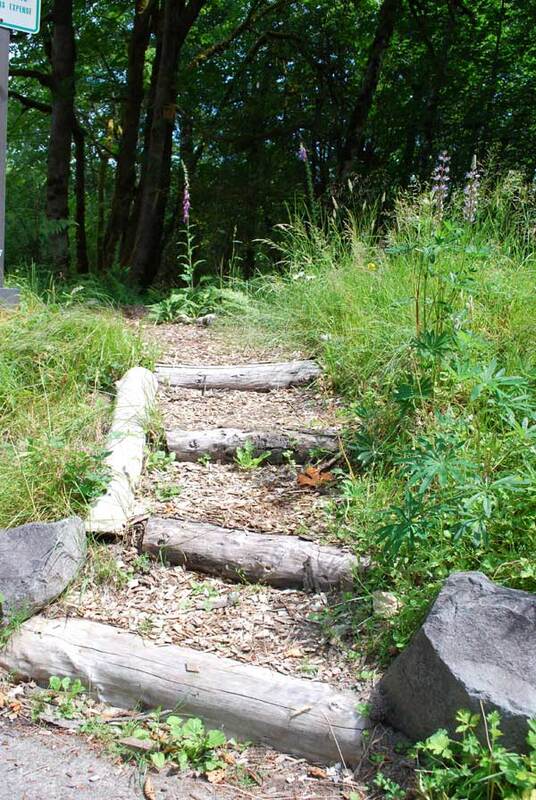 Likewise, the garden supports members of various communities outside of Evergreen - such as public schools, tribal communities and other cultural groups, to engage in learning activities independently or collectively. After the land was cleared in order to build the Longhouse, a landscape of mostly mud remained. 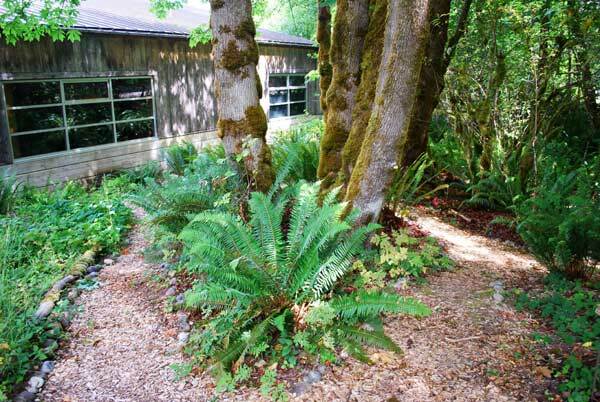 A few ferns were salvaged from the original site. The additional early plantings were largely salvaged from sites to be developed and used to establish the habitat areas. Some of the habitats represent those that would naturally be present at this site, while others do not. The process of enhancing this educational landscape is ongoing and open to coordinated participation. "We can really make use of, by gathering, the things the Creator has given us to gather. The life of the plant is provided by the Creator. It is ours to gather and then make use of. We are given the privilege of taking these things for our own use. We help ourselves. In doing so, we are honoring the Creator. These things are so special." We hope to express and teach this wisdom through our ongoing care for The Gifts Garden and through others' experience of it.